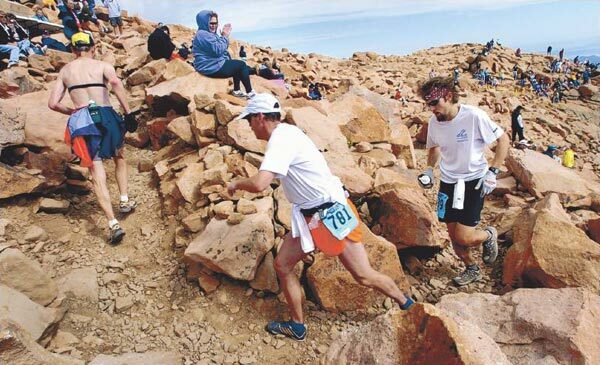 Pike’s Peak Ascent is a 13.3-ish mile run up Pike’s Peak mountain in Colorado. The journey begins in Manitou Springs at an elevation of 6,300 ft and ends at the Pike’s Peak summit at an elevation of 14,115 ft. That’s an elevation gain of 7,815 ft with the average grade being 11%. We live in Maryland– flat, sea level Maryland. You’re probably thinking “What? Why? How?” Let’s just say this is going to be quite the adventure. Nick and I have been training rigorously since May. At this point, we are as prepared as we will be. I won’t go into the nitty gritty details of our training regiment now. What I will tell you is that it involved a few trips to the Appalachian Trail for some trail hill repeats and way more time on a treadmill set to 10-12% incline than anyone should ever have to suffer through. The hard work was worth it though. I’m going into this run feeling relatively confident. In early July Nick ran the Catoctin 50K Trail Race and noticed huge improvements from previous years thanks to the Pike’s Peak training regiment. The training plan we followed was developed by Colorado native, and three-time winner of the Pike’s Peak Ascent, Simon Gutierrez. Finish – This seems like an obvious one, but you just never know. Finish Upright – I’ve heard horror stories of runners crawling up the 16 Golden Stairs. Finish in 5 Hours or Less – The rule of thumb is to add 30 minutes to your flat land marathon finish time (keep in mind, this is a half marathon), so this seems reasonable. Enjoy the Experience – I don’t want to get so caught in making it to the summit that I forget to..
Pike’s Peak is going to be an experience for me. I’m not treating this like I would a normal race. My goals are more aligned with “just finish” than they are with any particular time goal. I have 11 half marathons and 3 full marathons under my belt. I know what those distances feel like, and I’m ready for the next challenge. The ascent is going to be hard. Like really, really hard. Once we’re above tree line (10.2 miles and 11,950 ft) I don’t expect any more running. It’s highly possible we’ll mainly be walking/hiking well before tree line. Getting into our typical timed run/walk intervals probably won’t happen. We’ll run when we can and walk when necessary. I will be happy if we can maintain a 3.0 mph pace until we reach the last mile. The last mile, which includes the 16 Golden Stairs, will be the hardest and could take up to an hour. I probably won’t be able to breath for most of the ascent. There is absolutely nothing I can do at sea level to be fully prepared for the altitude. But you know what– plenty of flatlanders do this race every.single.year and they survive. Some are even top finishers according to the Pike’s Peak website. We’ve trained hard and I’m not overly concerned about it. I know it will be uncomfortable. But I also know that I am strong and in very good shape. I know that I didn’t experience altitude sickness the last time I was above 14,000 ft. I know that as long as I stay positive that I’ll be ok.
Having an anxiety attack due to feeling like I can’t breath. Witnessing someone else get hurt. Most people who’ve known me for a while know about my issues with anxiety. My biggest fear is that I’m going to get anxious and make myself sick. Knock on wood– I haven’t had any real issues with anxiety in the past year and a half. A lot of my anxiety is caused by lack of control– the “what ifs”, and one way to deal with it is to acknowledge the fears. You name the fear. Then decide if it is legitimate or not, and if it is, determine how to deal with it if your fear comes true. 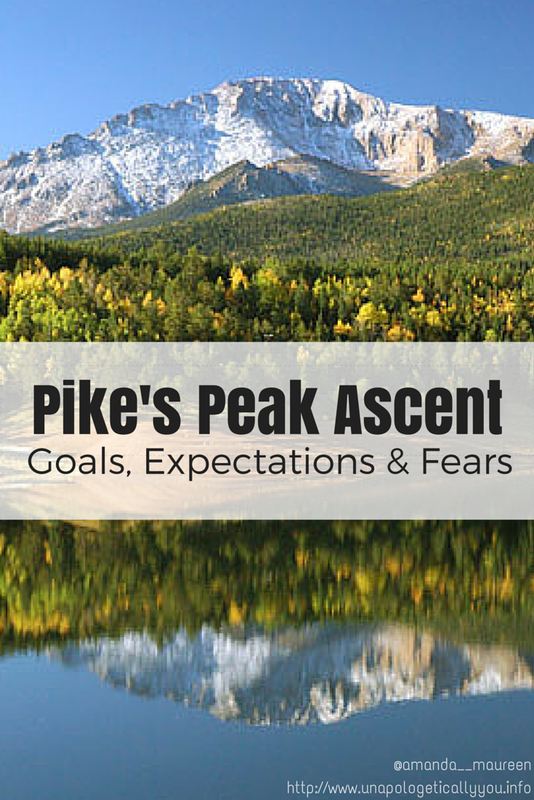 At this point there is nothing more we can do to prepare for the Pike’s Peak Ascent. We’ve followed the plan. Now it’s time to trust that plan to see us through the race. Stay tuned for the next installment of my Pike’s Peak experience where I discuss how a flatlander trains to run at 14,115 ft! Your turn! Have you ever run a race where you can’t fully simulate race day conditions? What were your expectations for it? What was the hardest race you’ve ever done? This post is linked up with Jill for #TheFitDish and MCM Mama Runs for Tuesday’s on the Run.